Navajo war vet Charlie Henry thought he left war behind in Afghanistan. When he’s invited to attend the dedication ceremony of Albuquerque’s newest public park, and a monument to its local heroes, he didn’t realize within a few moments, he’d find himself dodging sniper fire. Helicopter pilot Nathan Whitaker, seated next to Charlie, dies of his wounds, but a check of the area makes police wonder if who was the actual target. Both men have people who’d like to kill them. Charlie’s been seeing Ruth Brooks, who has an abusive ex, a man currently in prison thanks to her testimony. Whitaker had an ex-wife with whom he’d reconciled, and Patricia Azok was planning to divorce her current husband so they could re-marry. Nathan headed an employment placement service for returning vets and had run-ins with his more combative clients. He’d also dated his bookkeeper, Anna Brown, who wasn’t happy about his reunion with Patricia. After the police learn Lawrence Brooks has escaped prison and Patricia’s husband is stalking her, they have two viable suspects. When Dawud Khoury’s business and home are attacked, and his children terrorized, more complications arise. No matter that Dawud saved Charlie’s life in Afghanistan at the risk of his own, all people see is that he’s a foreigner and immediately pin a terrorist tag on him. Steve Azok’s death sends a trail of clues to the business Nathan Whitaker ran, where a hint embezzlement fills the air. Suspicion falls on Anna when Charlie’s business is firebombed and his car run off the road by a woman driver. Charlie and business partner Gordon must sift through the facts as they dodge more bullets, but there are too many suspects, the killer’s closing in, and time is running out. With its themes of terrorists’ threats, mob rule, and the plight of returning vets, Kill the Heroes weaves a suspenseful thriller with an up-to-date and cogent plot. Charlie’s reactions to the situations in which he finds himself reveal that warfare training doesn’t disappear once a man’s no longer in uniform. He’s readjusted to civilian life well, and this is contrasted starkly with the problems faced by the men aided by Nathan Whitaker’s organization. Though Navajo, Charlie’s Native American heritage is mentioned only in passing, and will undoubtedly leave the reader curious for more information in regard to his background. Physical descriptions of the main characters are scarce, leaving it to the imagination to supply how they look. Readers may wonder why the police allow a victim of a crime to be an active part of the investigation. Though a recognized facet of this genre, with the protagonist going behind official backs to find the killer, in this novel, Charlie and Gordon appear to completely take over, authorities hovering in the background as mere backup. 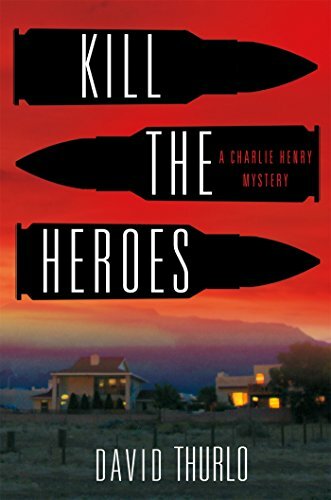 A suspenseful thriller with its sniper-on-the-loose plot, as well as a social commentary on the problems returning soldiers face, Kill the Heroes is an enjoyable read with a likeable character in its hero, Charlie Henry.